Typhoon’s meticulous attention to detail and craftsmanship is why our customers agree that the 33 Center Console is genuinely the most fishable center console afloat. Crafted with an 11’ beam and multi-stepped hull, it boasts an incredibly stable one-level flush deck from bow to stern and a unique amount of unobstructed deck space. Every Typhoon is custom outfitted to meet your individual needs. The center console boasts a superb helm, ergonomically designed operator station, 6’4” headroom below complete with a Bowmar hatch/sky light, seven foot vee-berth, interior rod storage, stand up shower, head and sink . Safety is our number one focus and priority. 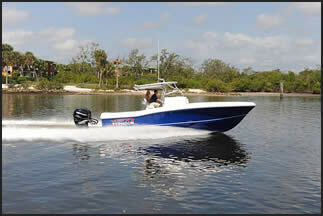 Our boats are very sea worthy, designed for use in the open ocean where the elements are constantly changing. Mechanical safety and dependability is paramount. We have been very careful in locating the design center of gravity, to achieve the correct attitude while underway, as ideally the boats position must remain flat, not bow up or bow down. All Typhoon Models are designed to be multi functional to suit the needs of the die hard fisherman, scuba divers, family/recreational users, or scuba divers. 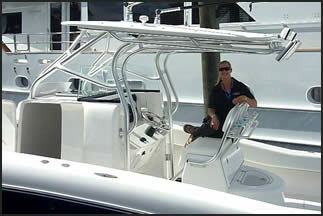 All Typhoon boats come with a 10-year hull warranty and a 1-year warranty on all factory installed accessories. As we are continually trying to improve our boats performance and design, features and otherwise generally enhance our products, Typhoon Boat Works reserves the right to change design features, specifications, accessories, options, equipment availability and price without prior notice.